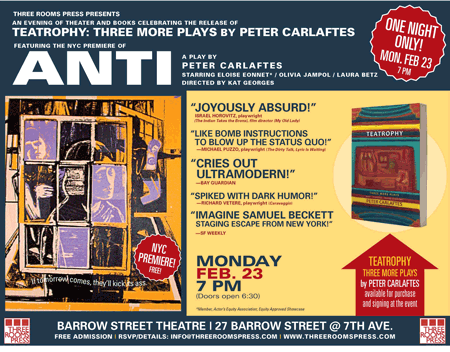 Three Rooms Press presents of evening of provocative theater, including the NYC premiere of ANTI, to celebrate the release of TEATROPHY: THREE MORE PLAYS ((Three Rooms Press Trade Paperback Original; February 24, 2015; ISBN: 978-1-941110-13-3, 138 pages; $15.00) the new book by Peter Carlaftes. TEATROPHY will be available at the event for purchase and author signing. The event is free. Doors open at 6:30 pm. One night only. Reservations are recommended, but not necessary. Additional info and reservations: info@threeroomspress.com or 212-731-0574. Barrow Street Theatre, 27 Barrow Street (at 7th Ave.), New York, NY 10014. *Member, Actor’s Equity Association; Equity Approved Showcase.